Fundraiser by Sarah E. Medley Pettigrew : Save Our Soup Kitchen's Home! Save Our Soup Kitchen's Home! Our Soup Kitchen is in Danger of Closing Our Doors! Salvation Army Mitten Tree Project, Thanksgiving Basket Project, Detroit Soup Kitchen, Heifer International, Christmas Gift project to neighboring schools, free monthly children's activities, an annual free neighborhood carnival, a free weekly vacation Bible school, and support of other national and local organizations. We are a small group, but our commitment to the greater community is far-reaching and based in altruism and compassion. Now we have found ourselves in our hour of need. We have begun to truly feel the impact of years of struggling to maintain an aging building, and a recent emergency repair to our sanctuary will all but drain our dwindling funds. We are at a critical point in our mission where we will have to face the bleak possibility of closing our doors, and in turn, closing our doors to the many ministries we support. Without support for First Congregational Church of Wyandotte, the Wyandotte Soup Kitchen will esentially become homeless. We recognize that many in our support network choose not to affiliate with organized religious groups, or that our countless volunteers come from other church or faith organizations that also need extensive support. In the past, we have always kept a separate line item of all funds in an effort to allow our donors the option to soley support the soup kitchen. However, we know that our fate is deeply intertwined with First Conregational Church's fate. If the church does not raise critical funds, we will be forced to close our doors. What is Waynewright Community Meals?!?!? 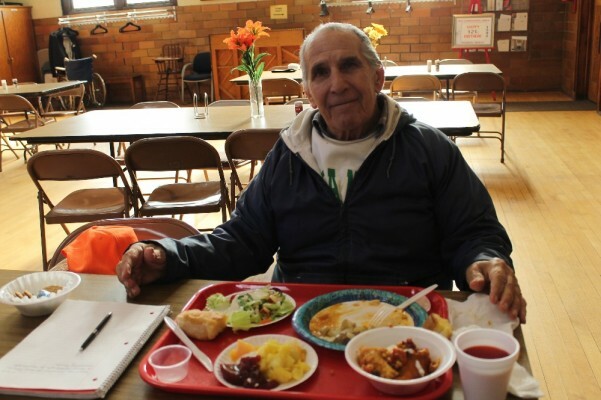 Located within First Congregational Church of Wyandotte, Waynewright Community Meals (often known as "the Wyandotte Soup Kitchen") serves a warm meal and a bagged lunch Wednesdays & Saturdays, 12:00-1:00pm. We aim to become a center of community life where health and education events occur, meals are served,and stories are shared. Our organization functions solely through the efforts of volunteers. We have no paid staff, and 100% of our (limited)funding goes toward the purchase of pantry items, paper products, utilities, and other goods related to serving meals and hosting community events. Guests are encouraged to arrive between12 and 1pm for a hot meal, and to take a bagged lunch upon leaving the fellowship hall. Guests do not need to meet any criteria in order to join us- no questions are asked, and all are welcome. Guests sign in upon entry, but this is merely for the sake of keeping a count of number of guests served. Guests are welcome to sign an alias or merely write "guest" in the logbook. We have an "If we have it, we give it," philosophy. During the course of each meal, we may distribute items ranging from food staples, hygiene supplies, winter gear, farm market surplus, and other goods depending on the generosity of our community. We offer a range of community events and programming, including health screenings, cooking classes, holiday parties, social/educational events, and the distribution of goods (and good). We are always striving to become a center of community life where stories are shared, friendships are forged, and lives are enriched. We have great faith in the community that continues to sustain us. In countless incidents, we have handed out our last jar of peanut butter only to have a stranger arrive moments later to fill our shelves. Today, we are hoping that you will be part of a movement to provide our greater rescue. No act is too small as we strive to keep the doors open at First Congreational Church. For years, we have been stitched together by a menagerie of threads, some of them taut and strong, and some of them ragged and frayed. All of these efforts, both large and seemingly small, have collectively led us to weave a strong net of safety for those enduring danger, hardship, and heartache. We hope that you will help us to repair the tatters and snares that threaten this ministry, and allow us to keep our mission strong. We are certain our important work is not yet finished, and that the work we do has true value to our sisters and brothers in the greater community. We hope that our community will respond in kind! We also welcome your help in the form of insights, prayers, and suggestions as we embark on this journey! Many thanks in advance! We apologize for any difficulties with making donations! There was a technical glitch that should be alleviated now! What a joyful start to our campaign! We are so energized by the evidence that our greater community - and we mean folks from all over the country! - believes that our work is not yet finished! Thank you to everyone who continues to spread the word about the work that we do, and for those who have shared in order to help us overcome this obstacle! We are proud to serve on your behalf!!! Thank you for your help for all of us. My sister-in-law attends this church. They were so kind and helpful when my brother died, and then a few weeks later, my poor sister-in-law lost her mother too. They are a big asset to the downriver area. Please help if you can.